Constraining the ball joint is simple in itself, but it allows for 360 degrees of unconstrained motion about the center point. For modeling interference on a heim joint/rod end, this is unrealistic. I need to constraint the ball joint, lets say, to 50 degrees to movement off of a neutral axis through it, I.E. if the "axis" of the "ball" would create a "cone" in space if you were to move the ball joint about it's limit of rotation. If anyone could help me out that would be great. I was thinking of making some form of constrait stating that the axis of the ball itself can't be more than 25 degrees off of a stationary axis... but I don't really know if I can do that. Re: Constrain Angular Travel of Ball Joint? I am trying to create a chain in Creo and encounter the same problem. 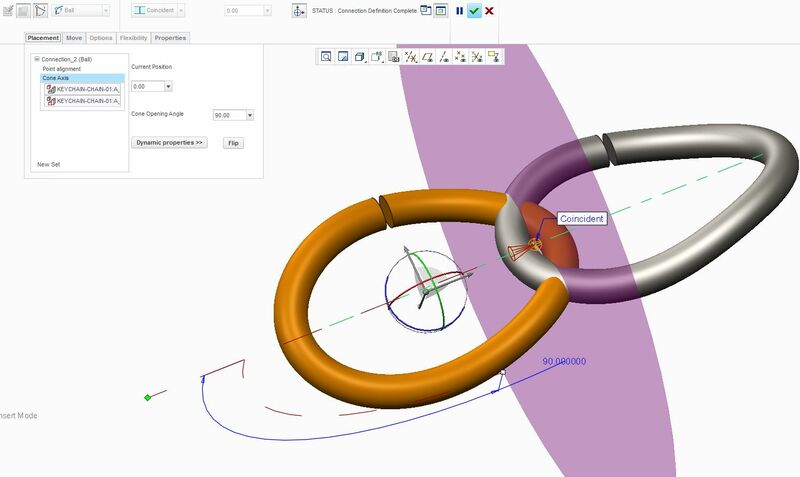 ball joint seems the most suitable connection type to simply connect two chain links, you are able to limit the "cone opening angle" in Creo 2, but the cone is always 360 degrees revolved. It would be nice if I could set limits for this to avoid interference! Does anyone know how to succesfully avoid this? You'll need to use two pin joints.